Neuromyelitis optica (NMO) is the most common cause of longitudinally extensive transverse myelitis (LETM), which comprises a spectrum of demyelination disease involvement in the optic nerves and spinal cord. The appearance through magnetic resonance imaging (MRI) of spinal cord lesions and serum NMO-IgG positivity plays a central role in NMO diagnose.,, Different studies in children with NMO have reported a wide range of AQP4-IgG seropositivity (7%–80%). Nevertheless, 10%–40% of patients diagnosed with NMO remain seronegative for AQP4 antibodies. Hence, it is not always easy to exclude the NMO diagnosis. In about 1% of all cases of Mycobacterium tuberculosis (MTB), the central nervous system (CNS) is affected. CNS manifestations of tuberculous typically include meningitis (i.e., in 95% of cases), followed by tuberculoma, abscess, calvarial tuberculosis, pachymeningitis, and spinal arachnoiditis. MTB is a very rare cause of transverse myelitis. An abnormal activation of the immune system against the spinal cord is thought to serve as the etiological mechanism. Infection of the CNS by MTB can imitate NMO, and some reports have shown that the immune responses to pulmonary MTB infection may cause NMO., In addition, a few case reports of intramedullary spinal tuberculosis have also been published. Although previous reports mention a correlation between TB and NMO, a recent report failed to find a significant correlation. It may be difficult to distinguish between tuberculous myelitis and NMO. A 17-year-old female was admitted to bilateral blurring of vision, neck pain, and headache; she had experienced these symptoms for 5 days. She had neither a remarkable medical history nor infectious symptoms. She had been vaccinated for Bacillus Calmette–Guérin in infancy. Initial vital signs were within normal limits: body temperature 36.4°C, heart rate, 80 beats/min; blood pressure, 100/60 mmHg; and respiratory rate, 20/min. Her weight and height were 56 kg (percentile 50%) and 155 cm (percentile 10%), respectively. On physical examination, optic neuritis was diagnosed with pallor optical disc, although the cranial nerves, muscles power, and deep tendon reflexes were all normal. The result of other system examinations was unremarkable, except right cervical lymphadenopathy (2 cm × 2 cm). Her primary laboratory data were as follows: white blood cell counts, 9.700/mm3, neutrophils, 65%; lymphocytes, 25%; monocyte, 10%; hemoglobin 9.7 g/dL; platelets, 242.000/mm3; erythrocyte sedimentation rate, 50 mm/h; C-reactive protein, 12 mg/dL; urea, 43 mg/dL; and creatinine, 1.54 mg/dL. All other measures were within normal limits. 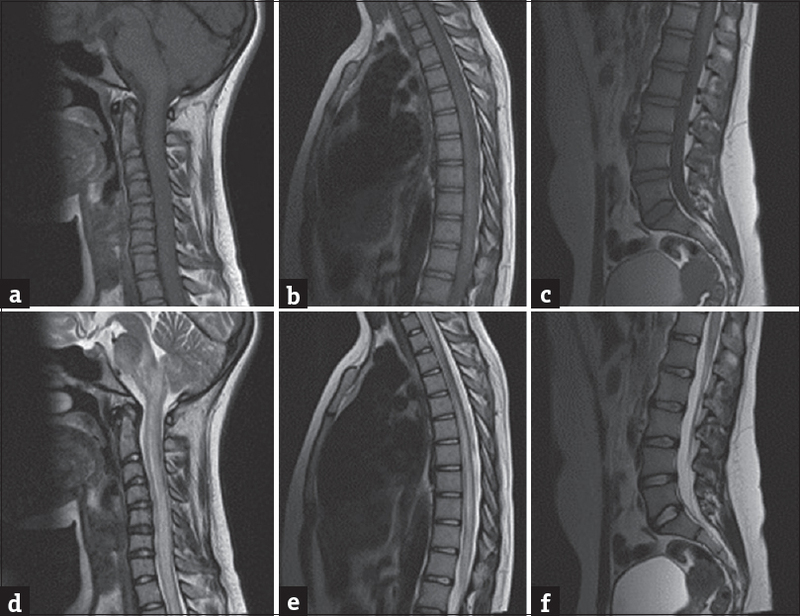 MRI of the spine showed an intramedullary lesion that was isointense on the T1-weighted and hyperintense on the T2-weighted images, extending from the brainstem to the full lumbar spine [Figure 1]. Vertebrae, intervertebral discs, and brain MRI were normal. The MRI images were consistent with a diagnosis of holocord LETM. Lumbar puncture showed normal intracranial pressure (160 mmH2O). Cerebrospinal fluid (CSF) analysis revealed 11 cells/mm3 with lymphocyte, and elevated protein (148 mg/dL) and normal glucose (59 mg/dL) levels. CSF polymerase chain reaction (PCR) for MTB, herpes simplex virus, Streptococcus pneumoniae, Neisseria More Details meningitidis, Haemophilus influenzae, and Enterovirus, acid-fast bacillus (AFB) stain, and an agglutination test for Brucella More Details were all negative. Serology results for Lyme and brucella in the blood were negative. CSF NMO antibodies and oligoclonal bands were negative. Serum viral serology was unremarkable, and an ELISA for human immunodeficiency virus was negative. On follow-up, blood pressure was found to have remained high (220/110 mmHg), and urea and creatinine levels had progressively increased (132 mg/dL and 3 mg/dL, respectively). The markers for autoimmune and connective tissue disorders (i.e., antinuclear antibodies, anti-dsDNA, C3, C4, Coombs, anticardiolipin antibody, thyroid-stimulating hormone, and free T4) were all negative, and echocardiography and urine calcium testing were within normal limits. Sarcoidosis was ruled out by the laboratory tests. Chronic renal failure was diagnosed, but hypertension could not be controlled, despite aggressive medical therapy. The result of tuberculin skin testing (TST) was positive (23 mm), but the chest X-ray was normal. AFB and MTB-PCR on three consequtive sputum samples were negative. The results of the patient's immunological screening tests were normal. On follow-up, the patient had transient left upper limb muscle weakness (muscle power grade 4/5). Pulse steroid therapy was initiated. Computed tomography of the chest revealed a calcified lymph node (3 cm × 1.5 cm) in the right paratracheal region. On abdominal MRI, a few nodular lesions were detected on the left liver lobe. On the histopathological evaluation of the cervical lymph node and liver, necrotizing granulomatous inflammation with positive AFB was detected. The clinical and imaging findings supported a diagnosis of disseminated tuberculous with holocord LETM. Four antituberculous drugs (isoniazid, rifampin, pyrazinamide, and ethambutol) were administered with corticosteroid therapy (2 mg/kg/day). The patient received prednisone for the first 8 weeks. All sputum, tissue, and CSF cultures remained negative for MTB. After 16 weeks of treatment, her complaints disappeared, and the results of control spinal MR were completely normal [Figure 2]. At the end of the one year, antituberculosis therapy was stopped without any sequelae. Disseminated MTB is defined as tuberculous infection that involves the blood stream, bone, bone marrow, liver, or two or more noncontiguous sites, or miliary MTB. The symptoms are nonspecific, as seen in the current case, and the duration of symptoms before diagnosis can vary. On spinal cord MRI, evidence of increased signal on T2-weighted images extending through three vertebrae is considered to denote LETM. MTB rarely causes myelitis, but when it does, it commonly appears as cervicodorsal focal myelitis. Long lesions in the spinal cord are usually due to tuberculomas or abscesses, rather than myelitis. Our patient had widespread spinal cord involvement from the brainstem to the conus. In NMO patients, LETM lesions with holocord involvement were found in 73.9% of patients. LETM are seen rarely in childhood MTB, and holocord LETM has been reported in only one patient. To the best of our knowledge, our patient is the second case. In Sahu's study, four MTB adult patients have been reported with LETM without holocord. On admission, we thought our patient to have NMO or connective tissue disorders, given the presence of accompanied hypertension and renal failure but absence of infectious symptoms. NMO is an immune-mediated neurological disorder, and autoimmune disorders frequently coexist with systemic lupus erythematosus, diabetes mellitus, and hypothyroidism. Although CSF anti-AQP4 antibody testing was negative, NMO was considered in the differential diagnosis. Because, 10%–40% of patients diagnosed with NMO remain seronegative. The patient had no history of Behçet's disease and did not describe any symptoms associated with active tuberculosis disease. TST was positive, and the necrotic granulomatous were detected on a cervical lymph node and hepatic lesions, that AFB positive despite MTB cultures being negative. Based on pathological diagnosis, NMO was excluded, and the patient was successfully treated with antituberculous drugs and steroids. In the case of Jain et al., at a 2-month follow-up visit, LETM was found to accompany brain tuberculoma as a paradoxical expansion after MTB treatment. Paradoxical tuberculous LETM is seen in association with brain tuberculomas when patients are placed on antitubercular drugs. The initial clinical response to treatment may cause development of new lesions or expansion of preexisting ones due to lysis and release of tubercular proteins. In our patient, LETM was detected before MTB treatment. We consider that in our case, the LETM mechanism is that MTB shares antigens with myelin basic protein, thus sensitizing lymphocytes to mycobacterium and facilitating their attachment to myelin. Our cases highlight the fact that MTB may be a more common etiological agent for myelitis than was previously assumed. We wish to draw attention to the fact that MTB should be keep in mind when making differential diagnoses of myelitis, especially in endemic areas. If tuberculosis myelitis can be diagnosed early, the response to treatment before complication development may be favorable. Sahu SK, Giri S, Gupta N. Longitudinal extensive transverse myelitis due to tuberculosis: A report of four cases. J Postgrad Med 2014;60:409-12. Siddiqi SA, Hashmi M, Azmat Z, Mustafa S, Siddiqui KA. Pulmonary tuberculosis with neuromyelitis optica: An uncommon association of a common disease. J Coll Physicians Surg Pak 2012;22:527-8. Li R, Zhong X, Qiu W, Wu A, Dai Y, Lu Z, et al. Association between neuromyelitis optica and tuberculosis in a Chinese population. BMC Neurol 2014;14:33. Tenembaum S, Chitnis T, Nakashima I, Collongues N, McKeon A, Levy M, et al. Neuromyelitis optica spectrum disorders in children and adolescents. Neurology 2016;87 9 Suppl 2:S59-66. Jain RS, Kumar S, Tejwani S. A rare association of tuberculous longitudinally extensive transverse myelitis (LETM) with brain tuberculoma. Springerplus 2015;4:476. Wang JY, Hsueh PR, Wang SK, Jan IS, Lee LN, Liaw YS, et al. Disseminated tuberculosis: A 10-year experience in a medical center. Medicine (Baltimore) 2007;86:39-46. White C, Leonard B, Patel A. Longitudinally extensive transverse myelitis: A catastrophic presentation of a flare-up of systemic lupus erythematosus. CMAJ 2012;184:E197-200. Kasundra GM, Sood I, Bhushan B, Bhargava AN, Shubhkaran K. Distal cord-predominant longitudinally extensive myelitis with diffuse spinal meningitis and dural abscesses due to occult tuberculosis: A rare occurrence. J Pediatr Neurosci 2016;11:77-9. Mirbagheri S, Eckart Sorte D, Zamora CA, Mossa-Basha M, Newsome SD, Izbudak I. Evaluation and management of longitudinally extensive transverse myelitis: A guide for radiologists. Clin Radiol 2016;71:960-71.